Note: The Arts and Industries Building is closed for renovation, but open for special events. 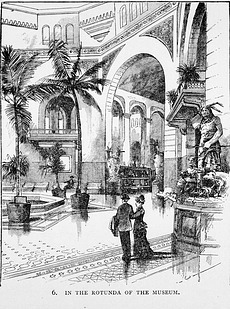 When the US National Museum, now known as the Arts & Industries Building, opened in 1881, it was the embodiment of the hopes and dreams of one man, Spencer Fullerton Baird (1823-1887), second Secretary of the Smithsonian. The opening of the National Museum Building also irrevocably established the Smithsonian as the national museum of the United States. When James Smithson (1765-1829) wrote his will, he was quite vague about what he expected his institution for "the increase and diffusion of knowledge" to be. The United States Congress debated for a decade whether the Smithsonian should be a library, university, astronomical observatory, scientific research institute, or even a museum. A quintessential American political compromise, the 1846 act establishing the Smithsonian included almost all of these things. 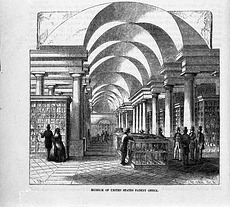 The first Smithsonian Secretary, Joseph Henry (1797-1878), a physicist, wanted the Smithsonian to primarily be a scientific research institute. He was reluctant to run a museum or national library that might use all the Smithsonian's funding and leave little for basic research. He believed museums reached only a local audience and the Smithson bequest should not be spent on popular attractions. However, Secretary Henry did believe in collecting natural history specimens for research. In 1850 he hired a natural history curator, Spencer Fullerton Baird, who arrived at the Smithsonian with two railroad cars of natural history specimens and a dream that he would someday be the director of a great national museum. Born in Reading, Pennsylvania, in 1823, Baird was a naturalist and inveterate collector. When he was hired, the Smithsonian was a mere four years old, and the Smithsonian Institution Building, or "Castle," was still under construction. 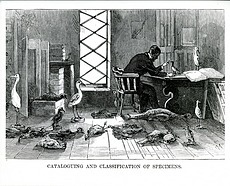 The natural history collection consisted of 6000 specimens which Baird immediately set about working up for publication. 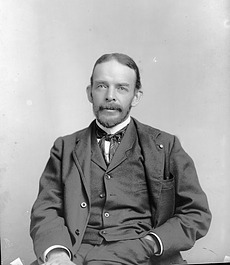 Baird spent his early years carrying out Henry's programs, publishing scientific books and coordinating the international exchange of thousands of publications. But he knew what he really wanted to be doing, so he quietly but steadily built a museum collection. 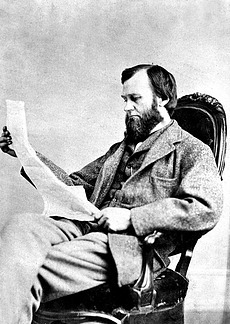 In July of 1853, Baird wrote to his mentor, Smithsonian Regent George Perkins Marsh, "I expect the accumulation of a mass of matter thus collected (which the Institution cannot or will not 'curate' efficiently) to have the effect of forcing our government into establishing a National Museum, of which (let me whisper it) I hope to be director. Still even if this argument don't weigh now; it will one of these days and I am content to wait." Baird had to wait until Secretary Henry's death in 1878 to get his own museum, and had only a few years to set it on its course, but in the end, his dream was realized in this building. At the time of the Castle’s completion in 1855, our young nation was beginning to establish national collections, but had no way to care for them. 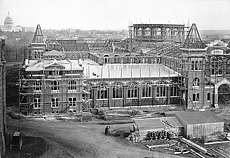 For many, the Smithsonian was that place and the Castle was soon filled with objects of art, culture, industry, and science, regardless of Secretary Henry’s wishes. 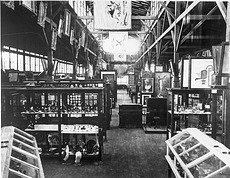 Prior to coming to the Smithsonian, many of these art, historical, and natural history collections were housed at the Patent Office Building in the museum of the National Institute, a private group formed in 1840. As the founding fathers passed away, concerned citizens sought to preserve their memory by collecting tangible objects associated with these noted men. Called the "Historical Relics Collection," these portraits, military gear, and artifacts of everyday life soon gained iconic status as these objects came to stand for the ideals, values, and accomplishments of the men who had once used them. Scientific specimens from government expeditions were also placed on display. 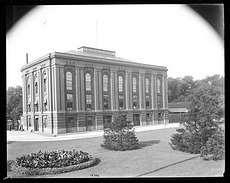 The National Institute gallery soon became a popular Washington attraction, but it lacked the funding and staff to properly care for its rapidly growing collections, so the Patent Office was given responsibility for this "National Gallery." In 1858, the Smithsonian took its first big step towards becoming the National Museum when the National Institute's scientific collections were transferred to it. The Congress then gave the Smithsonian its first federal appropriation to care for these national collections. Baird devoted himself to the collections and in 1872 was given full responsibility for the U.S. National Museum. Baird's dream received a great stimulus when Secretary Henry appointed him to the interagency committee to prepare the government exhibits for the Centennial Exposition in Philadelphia in 1876. The Congressional plan for the government exhibit in Philadelphia had an interesting provision: it stated that the appropriation was to be considered a LOAN to the exposition directors. If income from the exposition was sufficient for the loan to be repaid, Congress would then allow part of those funds to be used to construct a National Museum Building. This tantalizing possibility seems to have motivated Baird to do his very best. Assisted by his talented young curator, George Brown Goode, Baird produced all the government exhibits. His award-winning displays received great public acclaim and gave the Smithsonian national visibility. The Smithsonian exhibit consisted of two parts: the first section was on the Smithsonian's research programs and the second had National Museum exhibits on the ethnology and natural history of North America. The government exhibition was considered by many to be the most successful part of the immensely popular Centennial. At its close, Baird convinced many exhibitors to donate their artifacts and specimens to the National Museum, acquiring some 62 boxcars of materials in 4000 cartons. The Washington Armory Building Baird was given temporary use of the Armory Building on the National Mall, situated conveniently along railroad tracks. And since the Centennial did make a profit, Congress made it clear that they would entertain a request for a museum. When Secretary Henry died on May 13, 1878, Baird was named the second Secretary of the Smithsonian. He lost no time in going to Congress, and on March 3, 1879, $250,000 was appropriated for the construction of his National Museum. Baird did not want to spend time or money on a monumental structure. 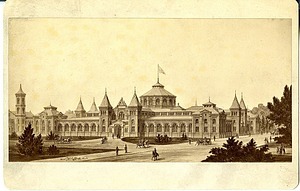 He proposed instead a simple building similar to the government exhibit building at the Centennial Exposition designed by General Montgomery C. Meigs. No wood was to be used in construction, ensuring that the building would be fireproof, avoiding another disaster like the 1865 Castle fire. Baird fought successfully to have the building placed next to the Castle, despite concerns that it would obstruct the view of that building. He argued that operating a distant facility was far too costly in terms of staff and operating costs, even requiring new sewer lines. Designed by architects Cluss and Schulze, ground was broken on April 17, 1879. National Museum Building Committee Baird assembled a distinguished Building Committee that included General Meigs and General William Tecumseh Sherman, both civil engineers. Baird and his building committee worried over every detail of construction. The building was completed by 1881, on schedule and within budget. Per square foot, it was the cheapest permanent government building ever built, with 80,000 square feet of exhibit space. The first event in the new National Museum building, even before its exhibits were installed, was the Inaugural Ball for President James A. Garfield and Vice President Chester A. Arthur on March 4, 1881. The festive and elegant event was attended by 7,000 people in the evening. Garfield was the first president to hold an inaugural ball at the Smithsonian. 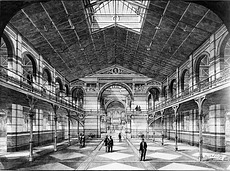 This engraving shows the North Hall of the National Museum, with temporary wooden flooring installed for the ball. The initials of President James A. Garfield and Vice President Chester A. Arthur were stenciled on the walls near the Rotunda. Bunting was hung from the balconies and garlands draped from the ceilings and walls. The seal and flags of each state were hung on the lower walls. 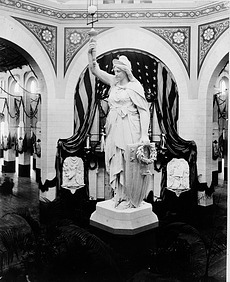 In the Rotunda, a statue called America, holding an electric torch above her head, was installed for the occasion. The sculpture was representative of the skill, genius, progress, and civilization of the United States in the 19th century. In addition to two electric lights in the Rotunda, 3,000 gas lights were installed throughout the building. Some 10,000 bins for hats and coats were also built for the celebration. When the inaugural festivities were over, Baird prepared the building for the public. As soon as the permanent floor was laid, the work of installing exhibits began. 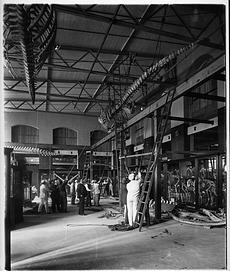 Massive specimens of marine mammals were hoisted into place. 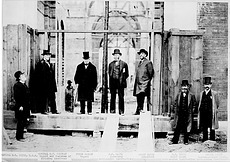 A team of watchmen and laborers was hired for the building. The building opened to the public in October 1881, and in its first full year, 1882, the guards counted 167,455 visitors. Initially the ground floor was completely open and devoted to exhibits. 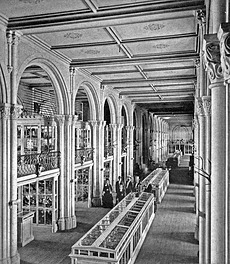 The halls were furnished with mahogany exhibit cases that were 8 feet, 8 inches long, to fit the architectural design of the building. They were easy to move so exhibits could be reconfigured without great difficulty. The cases themselves served as the partitions between exhibits. The cases were dust-proof and insect-proof, with special Yale locks, and each case was wired with an electric alarm that ran to the Superintendent's office. When the U.S. National Museum opened its doors to the public in 1881, it was the realization of Baird's dream to create a great national museum to educate the citizens of a democracy, and display the country's accomplishments to visitors from all over the world. It welcomed millions of visitors until 2006, when it was closed for renovations until 2014.